Location Ibadan, Ife, Lagos, Akure and Osogbo. 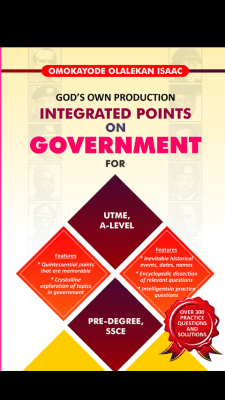 This book contains quintessential key points on Government that will make u to achieve the maximum score in Government in your UTME and PostUTME. 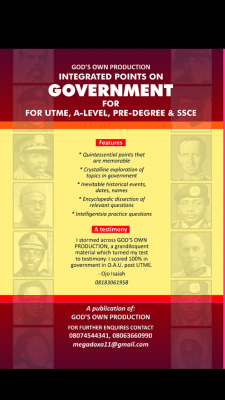 This book has been applauded by all the students that have made use of it for both UTME and PostUTME. Some of the students recorded 100% in their Post UTME. You can't afford not to have this great book as a student that offers Government. The book is also very useful for those preparing for WAEC, NECO, NABTEB and Pre-degree examinations.